Sunday, March 20thWe had to take a cab to Tel Aviv, which was 20 minutes from our location at Baptist Village. The problem was, the cab had to come at 2 am, and we were a little nervous, as we were on a compound on a dirt road near a nature preserve. Just when we thought the cab would not come, he arrived outside the gate. We were still afraid, because we were three women somewhere in Israel in a cab that we hoped was trustworthy. Yes, we’ve seen a lot of American hostage-type movies. But, add to that, my sister and I lived in a Communist country during the Cold War and you can possibly imagine how concerned we were about abduction.We had both decided that once the driver turned off the dirt road leading from our compound, if he didn’t head east, we would have to be willing to die trying to assure at least one of us got out alive– probably my daughter. I already had a text ready to send to my hubby just in case, so he’d at least know we’d made it into the cab. We were, of course, praying and both of us breathed a huge sigh of relief when he headed east towards the airport. I am so thankful that my daddy made me be his little navigator on family trips growing up. As a military brat, it was a valuable skill. As an adult who travels quite a bit, it has been an invaluable skill. As we approached the airport, I felt the feelings I did when we first moved to W. Berlin as a teen, there were guards with machine guns at the entrance, fences and high security. The cab driver warned us to have our passports ready. But, the armed guards waved us through without checking us. When we got to the airport, we got in line with all our luggage, and the security was more strenuous than I’ve ever seen, even during our time living behind the Iron Curtain, although, that was probably because as Americans we had certain rights by treaty. In Israel, we have no special rights. There were two ladies working the line– one asked questions while the other one observed every single person in line, seemingly in a nonchalant manner. However, I have seen that seeming nonchalance, yet observant look on the face of Soviet guards, so I knew she was actually looking for any signs that anyone in line may be up to something. The young man in front of us made the huge mistake of saying he was visiting Palestine. Yes, some people refer to this whole area as Palestine, but these were Israeli officials. He used a political term that got him such a hard grilling, he was nearly in tears and was shaking all over. The second lady who had been feigning nonchalance, was actually fully attendant upon his responses to the first lady who seemingly, was being ‘trained.’ The second lady now turned her full attention upon this young man and asked, why, if he had been there for a week, did he have only one bag? He claimed to have only the one around his neck, which was the size of a large gym bag. She asked if they were to believe anyone would travel all the way from the US to Israel and only bring one small bag? We thought that was odd too. She wanted to know exactly where he’d visited while there. Keep in mind that Bethlehem and Jericho are Palestinian towns in the West Bank. He should have referred to them by name, because referring to them as Palestine gave the impression that he was making a political statement. Next, she asked if he was traveling with a group, which he said he was, but for some reason he was not with them. So, they had to go find his group and question all of them. When it came our turn, we were asked how we were related, etc. However, one thing my sister had told me about traveling in the middle east is that traveling alone is often a red flag, which makes sense. So, we didn’t get grilled real hard, but it was a thorough questioning. Next, they scanned all our bags; they don’t even let you get past this point without having even your checked bags scanned. The machine then spit them out with such force, you’d think our bags didn’t weigh 50 lbs. each. I then got pulled for further inspection. I waited in one of three or four lines, but they kept pulling from the other lines. I didn’t want to look impatient, because I know that’s a no-no. But I was waiting for almost 15 mins, and we still hadn’t even made it to the ticket counter! One problem was they undoubtedly weren’t allowing anyone headed to Amsterdam to go without a physical inspection of their bags, so every person who was on the flight to Amsterdam was pulled. Finally, a black Israeli guy came and got me, he appeared to be Ethiopian, which would make sense, since many Ethiopian Jews returned to Israel in 1991. He asked me a couple of questions, unzipped my bag, and let me go. Everyone else got their bags poked, prodded, some totally unpacked, etc. Racial profiling worked for me in Israel! [From some brief searching, I have found that white American males are more likely to be held for extended questioning. I had been profiled and pulled in Phoenix on a trip to Berlin in 2002– I later discovered it was because I was black and had braids. Oddly, a lady in full burka was allowed on without any hassle.] Now we were finally headed to the ticket counter. It’s a good thing we left the compound at 2 am for our 5:45 am flight! By this time we were hungry, so we ate at McDonald’s. However, the food on the menu is nothing like the US or even Europe. Their mostly vegan menu did not appeal to me, but I was hungry, and the lines were long at the coffee and pastry kiosks. There was the breakfast meal: scrambled eggs with a large side of chopped tomato, onion, bell pepper, two hard rolls, three types of dipping sauce, juice and coffee. yum! (Not.) There was also a chickpea sandwich (I hate chickpeas, btw) among other vegan offerings. To our joy, the server informed us that they were offering the lunch menu even though it was only almost 4 am. We opted for a small burger, fries and Diet Coke. With value meals priced at $10 US, I was looking forward to the much lower price of food in Germany. Plus, Germans are carnivores. After eating, we went through security to our gate. I thought it was funny that everywhere else, you have to take off your shoes and belt. Not here. I say, if Israel doesn’t require it, it’s a waste of time here. These are the best trained airport security agents in the world. And all the security agents are young, highly intelligent and well-trained. They are also instinctual, I’m sure this is because of their mandatory military service training after high school as well as pride in being the best. I wonder why TSA agents aren’t trained in Israel? By 4:30 am we were finally boarding our Aegean Air flight to Athens. I never, ever fall asleep on a plane, no matter how hard I try. I actually slept a bit on this flight. The flight attendants were so friendly and cheerful. I was hungry again, so I ate –for the first time ever– a second breakfast. I felt like a Hobbit. When we arrived in Athens, we got out onto the tarmac (so that means we actually can count our very short stay in Athens as having visited there). We took a bus to the terminal; unfortunately we only had time to race through the airport and get back in a security line to board our our next flight to Berlin. It hurt to run past all the wonderful food places that served MEAT. There were also lots of appealing retail shops. But, we had to run to make our plane. Just as we were leaving security, my daughter got pulled (possibly the braids?). The security agents were very rude and unfriendly in Athens, but I look forward to returning for a real visit one day. The flight attendants were again, very friendly on the next Aegean flight. And we had– third breakfast!! (yeah, I was definitely being a Hobbit, because I did attempt to eat it). I told myself, who knows how many hours it will be before I eat again? We arrived in Berlin around lunchtime. We had to get a rental car, then go to the main Bahnhof (train station) because I had lost my reading glasses in Israel at the Baptist Village on the last day there. I could not see the map to read it with only my contacts on. So, we traveled into the former East side of Berlin to the flat we had rented for the week. The flat had been renovated, so it no longer had the communist feel on the inside that I remember from my time living in Berlin. It actually looked like it had been spit out of the pages of IKEA. Even the dishes had IKEA stamped on the bottoms. We were also thrilled that a full sized refrigerator was included. When we lived here, German refrigerators were quite small, especially given that our family consisted of five people at that time. 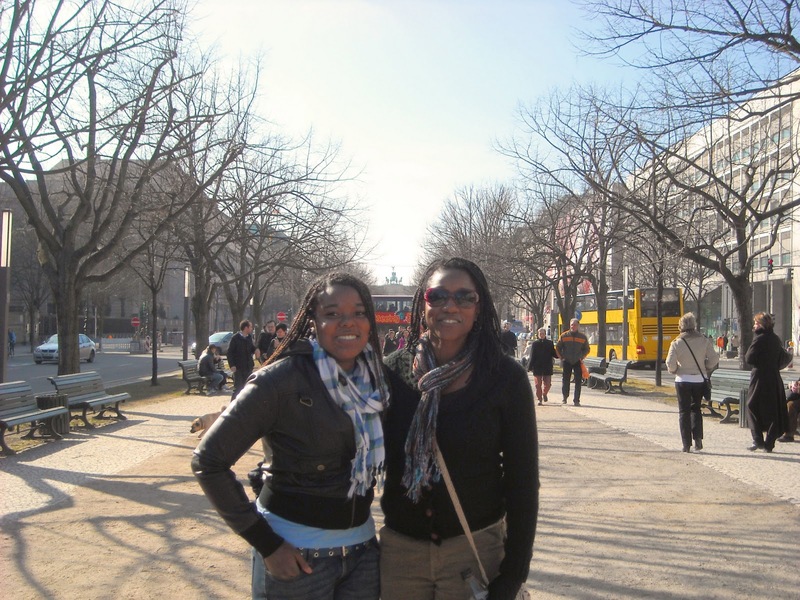 Anastasia wanted to try some bratwurst and authentic German bier, so we headed to Unter den Linden to get lunch. Unter den Linden is the grand boulevard that runs east to west through Berlin. 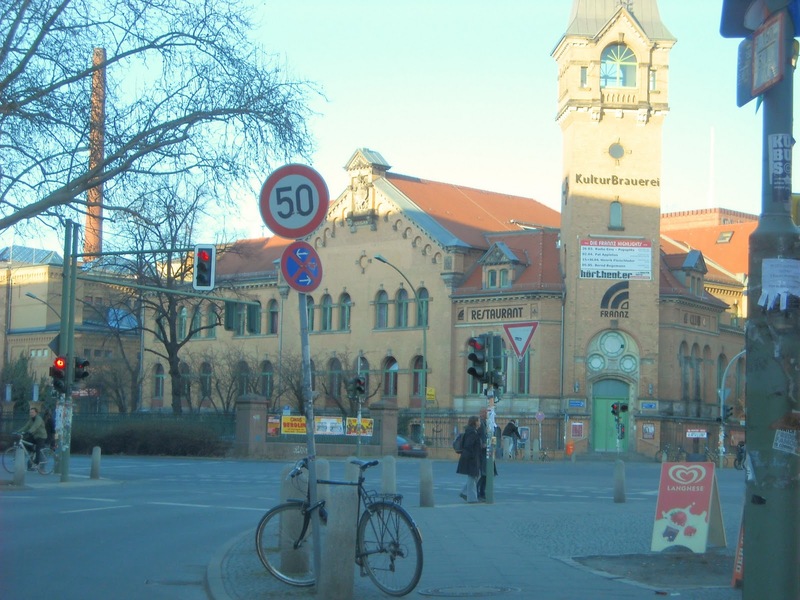 It is in the Mitte district (Mitte means middle, and this district is smack dab in the middle of Berlin). Linden means lime, and it is lined with linden trees on either side of the avenue. Unter den Linden means under the linden. It is beautiful in the summer when the trees are full of leaves. We were here on the first day of Spring, so the trees were still bare. One of the many things I love about Berlin, is street food. Germany is famous for its sausage, and Berlin has some of the best. Since I spent my teen years in Berlin, one of the things my friends and I lived on was the cheap ‘Imbiss’ food you could find on almost any corner. Imbiss stands sold wurst (sausage), all kinds. Our favorites were bratwurst, bockwurst, knockwurst, and currywurst. Currywurst by far was everyone’s favorite- especially since it was invented in Berlin after the war. And no matter the type of wurst, they were always served ‘mit pommes frites’ (with french fries). Those of my friends whose mothers were German would almost alway eat the fried covered with mayo. I always opted for the delicious curry ketchup. When we first moved to Berlin, I could not get used to this thin seasoned ketchup, called curry ketchup, but grew to love and prefer it to the American type. Currywurst is such a big deal in Berlin, that every candidate for Bürgermeister (mayor) of Berlin is always photographed at a currywurst stand. I guess it’s like kissing babies in the US. My sister and I were very excited to share the experience of currywurst mit pommes frites with my daughter. So we picked a stand along the Unter den Linden near Pariser Platz (in front of the famous Adlon Hotel). The young man working the stand had Tupac loudly playing and was jamming as he cooked. He was very happy to meet three Americans, especially black Americans. Because a major legacy of black soldiers in Berlin was the music and dance forms they introduced the populace to during the Allied occupation which lasted until 1994. Many of my German friends say that is what they miss most now that the Americans are gone– the music. But thanks to satellite radio, they now have full access to US music. He asked us if we liked Tupac and honestly none of us listen to Tupac so we had to say, not really. He enthusiastically welcomed us to Berlin, and we told him that my sister and I were returning ‘home,’ and introducing my daughter to Berlin. We all enjoyed a wonderful lunch in the open air, and then decided to look for a grocery store for the week’s provisions. Most grocery stores do not open on Sunday in Berlin, so we had a hard time finding a small grocery shop to buy food for dinner. We were really tired, and knew we would not want to eat out for dinner that night. However, we found a place to buy some pork Salisbury steaks, pureed potato flakes and drinks for dinner and breakfast. After getting groceries, we stopped at a street flea market on our way back to our flat. It was a fascinating array of antiques, junk, trinkets, food and even street performers.